Election Day is November 8th. Are Your Employees Entitled to Voting Leave? With Election Day quickly approaching, private sector employers should be aware of their obligations under state law to provide voting leave for their employees. While there is no federal law that requires private sector employers to provide employees with time off from work to vote in a national or state election, numerous states require that private sector employees be provided with either unpaid or paid time off to vote. Note: Many states have additional rules regarding time off to vote. Employers are strongly advised to review the applicable state law and contact a knowledgeable employment law attorney for further guidance. 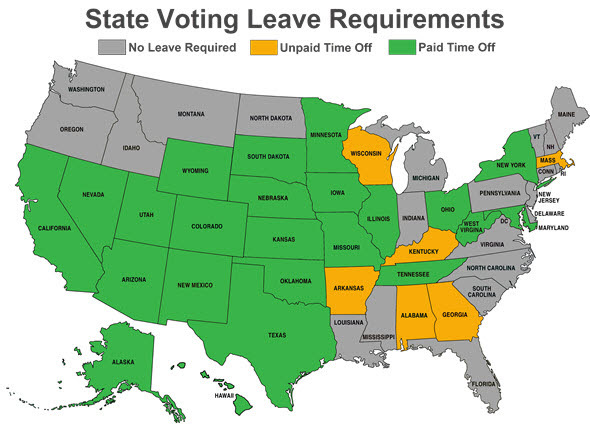 To review the voting leave requirements specific to your state, please visit our interactive map.